Two guys from Greece went abroad for a study and settled down in Berlin (Germany), founding a recording studio called 210 Studios. You meet with this more and more when reviewing albums of the eminent Norwegian label Indie Recordings. Until now, nobody knew that these guys, named Stamos Koliousis and Vangelis Labrakis also had their own band with Greek mates. 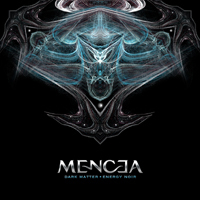 This musical adventure is called Mencea and in November 2008 they released their amazing debut album ‘Dark Matter Energy Noir’. We sent our thoughts through the virtual highway and Stamos Koliousis was superbly engaged to answer our questions. Aficionados of innovative modern extreme metal should look for the gem they released! Since this is the first encounter for most people with Mencea, please tell me about the previous history. When and how did the band come into being from the very start till this debut full length album? 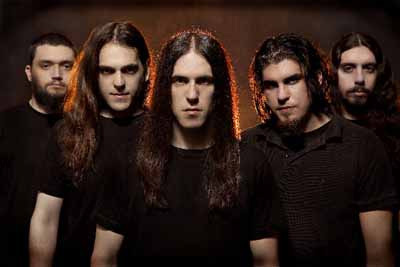 Mencea started playing together, back around 2004. We all come from pretty much the same area in Athens, so some of us had either been in different bands in the past, or knew each other from school, or college. Like any band, during its beginning, we did experiment, trying to figure out what we d like to do together. I guess after that, and around 2005 we did do a demo, which did contain 3 tracks from our debut. Can you tell a bit more about the background of every member? Each one of us, has had their own path over the years, some of us are working in music production, one of us works as a music journalist, another as a tutor in his instrument, but in general, we are all very close to each other as friends. What were the main influences when you embarked with Mencea? I think the same as now! Strapping Young Lad, Opeth, Meshuggah, Decapitated, etc. Did anyone of you have experience with other bands? Yeah we’ve all been involved in other bands and projects through the years. Not anything you would have heard of however. We all play for other bands as well on the side, Black Metal, Brutal Death Metal, Alternative Metal, Grindcore, Stoner Rock... We are all pretty much into anything heavy sounding. Why the name Mencea and what does it stand for? The name doesn’t have any significant meaning, it is just meant to symbolize what we do, and that is for a reason. We believe that once a band reaches some status, the name of it, regardless of what the word means, eventually becomes "the band", at least for its listeners. And we’ve all seen how bands choose a name at their early stages, which later on haunts them, in a negative way, just because it seemed cool at the time. In other words, we played it safe on this one. The geometry of it looks good, and sometimes it really helps that it does not stand for anything in particular, other than the 5 of us, and what we do. Who are the main songwriters or can we speak of a band effort as result of jamming? As we have had the issue of distance between the members, it was natural that the riffs were composed first. As a result of that, I did all the writing for this album, alongside our vocalist and drummer. We are not big fans of jamming, as the time we used to spend together back then, was not all that much, so we needed to make the most of it, and know what we were doing at every stage of the process. Things will be very different from now on though, as we are now able to have our own space to rehearse, and get together more often. What topics inspired you lyric-wise? Who writes the lyrics? ‘Dark Matter Energy Noir’ is a debut, yet one speaks about two producers in the band and the record was recorded by the band in 210 Studio in Berlin. Can you go a bit more into details about the producer experience of you, Stamos and Vangelis? Vangelis and I, have been working as sound engineers, doing mostly freelance work, since about 2000. We have worked with various bands in the past, but some of the more well-known ones have been Funeral, Stonegard, Iskald, Vreid, and quite a few others, non-metal as well. We both took care of all recording, production for the album, except from mixing and mastering. We operate in our own 210 Studios in Berlin, but also do freelance location work, mostly in Scandinavia so far. We have produced stuff for Daniel Bergstrand (Meshuggah/ In Flames), Rhys Fulber (Fear Factory, Paradise Lost), etc. We both love working with metal bands, and we’re always on the lookout for good bands to work with. Thank you! As soon as we had the preproduction for the album ready, we managed to send it over to 4 or 5 different producers, in Europe but the States as well. We were very happy to find out that all of them wanted to work with this album, and had decided on a well know Canadian musician/producer, to mix the album, as we were great fans of his personal sound. However before the agreement was sealed and by pure luck, our demo was brought to the attention of Daniel, who asked to have a chat with us. Being who he is, we immediately decided to work with him, which at the time seemed like something unreal. And how was it to work with him and your time in Uppsala? Mixing took about a week, and the experience had been a huge eye-opener for us. He has an extremely deep knowledge in what he does, and has a unique style and approach as well. He comes second to none, so for us it was a good tap in the back, pointing out that we are indeed doing what we do, well enough, to deserve it. The days in Dug Out, were very hectic, as there was a lot of stuff to work on, very little sleep, but it was all well worth it in the end. Another famous name pops up regarding the mastering: George Marino has done this in the US. Any thoughts on this? Well, we still feel completely honoured by that! He is a legend at what he does, and we are very lucky indeed, that we got the opportunity to get our album mastered by him! Did you play live already? Are there plans in that direction? Sure! We just played a show in Berlin, during Popkomm, which we filmed and recorded as well! We’re in our studio in Berlin right now, putting the finishing touches to the mix! The whole set will be featured as a bonus DVD disk that will come in the standard edition of our album. Besides that, we did a few shows last year, supported Paradise Lost, then 3 Inches of Blood in London, but overall we have been silently and steadily preparing for the DVD. Now that it’s done, our label is on the lookout for the first tour of this album, which should be around spring, and then we should be doing one more, in the fall of 09. So plenty of shows to come all around Europe! Can you tell a bit more about Achilleas Gatsopoulos – Hypnagogia Films and the artwork? Achilleas Gatsopoulos is a very talented designer and director, who happens to be a good friend of ours. He has worked for movies by Tim Burton, and he has also done stuff for Dark Tranquillity, Pet Shop Boys and many others. He did an amazing job on directing and post producing everything "picture-related" on the DVD, especially for the small budget we had for it. We did the mix in our own 210 studios in Berlin. Marcelo HVC is an upcoming designer from Brazil. He has done a lot of work for Indie lately, and it felt natural for us to go with him. We were pretty "locked" in what we wanted visually for the album, so we gave him some designs, and he did an amazing job with them. He is responsible for the whole graphic representation of the band. He is a great person to work with, and i m sure we ll be hearing more of him soon. In the past, bands from Greece often complained about the metal scene and establishment in Greece, though you have many great bands like Septic Flesh and Nightfall… did it change for the better? Do you have a different view on it as a younger band? There is a lot of stuff one can complain about in Greece. The metal scene is not unlike any other small country. What has certainly changed is that there are a lot more bands now than they used to be. And some do manage to break the borders eventually. As a band, since day one, we have tried to stay as far away as possible, from the reality of the scene back home. Some of us don’t live in Greece, and that did help in our evolution as much as it sometimes prevented it. As our musical output might suggest to someone, we don’t feel a need for belonging to any scene or style really, so we have been building up to this point, behind closed doors if you will. How did the cont®act with Indie Recordings come into being? Why did you choose them? The guys at Indie were really into the album, in the most genuine way. They had been playing the album over and over in the office for almost a year, before we finally started working together. Out of all the parties interested in signing us, Indie made a head-start offering an unheard-of contract for a debut band. We re not hiding the fact that one cannot turn down offers like that, but at the same time, after meeting them when we were in Norway once, we got the best feeling about them. As a band we never had false visions of grandeur, like bands tend to do. Just like we did with our music, but in a personal level for everyone, we want to progress one step at the time, and slowly but steadily build up. And Indie Recordings, being an exciting new label, which is constantly expanding and growing, we felt it was just appropriate for us to go with them. Well, we all do come from different backgrounds, however we obviously all share a great passion for Metal. Personally speaking, I am not listening to that many new albums the last few years when it comes to Metal. When I will listen to Metal, it will probably be something like late Meshuggah, old Megadeth, Slayer, Devin Townsend, but any other time it would be Nine Inch Nails, Peeping Tom, Mats & Morgan, King Crimson etc. I guess the most important role in this was played by my parents. I grew up on a steady diet of Led Zeppelin, Jethro Tull, Pink Floyd and other such great bands, but my first experience with Metal I guess was when I stole a tape from an older cousin of mine. It was ‘Powerslave’ by Iron Maiden, and it seemed and sounded so dangerous for me at the time, that for a year that was all I would listen to, after school everyday. Then, a family friend, around '89, started introducing me to other bands such as Kreator, Slayer, but also stuff like Soundgarden and Steve Vai. Cheers to him actually! What are your other interests beside music? Outside music, I guess they are everything a normal person does. Family and friends are of significant importance to me. Other than that, I like travelling, and when I’m not, just staying in, and relaxing. What are the plans and wishes for the near future? If everything goes according to plan, we’ll be going on two tours for this album, plus some selected shows here and there during 09. Hopefully we’ll manage to hop on an "appropriate" package on tour, and get our live act to as many people as possible. We are planning on starting writing material for the next album, which we intend to record during fall of 09, as long as touring won’t be in the way of it! When will the website be ready and on line? That should be just in time for the release date! For the time being we are based on www.myspace.com/mencea , plus we’ll have an E-Card out any day now, which will have an album sampler, one track from our live DVD, and the usual photos, and bio. I would just like to say that we have a bonus DVD disk, in the standard edition of our album, with a live set we recently did, during Popkomm 08, on the Indie Recordings Showcase night. We wanted to show to people, that even though we are a debut band, we do have what it takes to really do what we do, and that we are a real band, and not a studio achievement! We hope you’ll like it, and come check us out when we play near you! Thanks again for answering these questions and I wish you all the best with the standout debut and next endeavours! Thank you Vera, I really appreciate your comments! See you on tour hopefully!